Our mission is to end brain cancer by providing immediate patient access to specialists, advanced treatments, and comprehensive support programs. 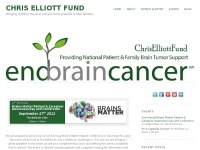 The web server used by Chriselliottfund.org is located in Scottsdale, USA and is run by GoDaddy.com, LLC. There are many websites run by this web server. The operator uses this server for many hosting clients. In total there are at least 5,889 websites on this server. The language of these websites is mostly english. For managing the data of the webpages the CMS WordPress in the version 4.0.1 is used. The website uses the latest markup standard HTML 5. To analyze the visitors, the websites uses the analysis software Google Analytics. The website prohibits search engines and webcrawlers using the description of the website from the Open Directory project and using the description of the website from the Yahoo directory. Other actions by webcrawlers and bots are allowed.